Don't let the road construction stop you! "Behind the Flower Clock in Las Colinas"
Good for any time of year: the Coban, or Shepherd, Salad. 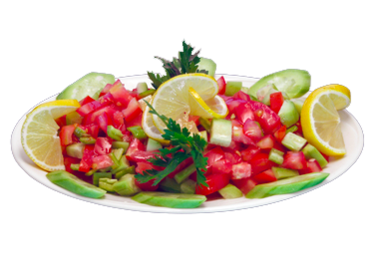 Ingredients may vary slightly, but it is basically ripe tomatoes, cucumbers, onions, flat parsley, and olive oil with vinegar or lemon, lightly salted—all the ingredients that a shepherd might have with him out in the field. Pair it with our fresh-baked pide bread and freshly made appetizers like our hummus or dolma for a light lunch. Or enjoy it as a side to an entrée like our grilled chicken or lamb shish kebap for a healthy and delicious dinner. 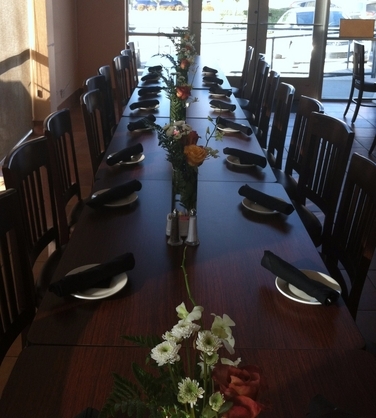 Our most important goal is to make our diners happy! But we love it when others tell us how much they love our food. 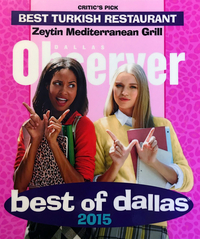 We were selected Best Turkish Restaurant in Dallas by the Dallas Observer (read it here), best lunch Mediterranean Buffet in Irving (read it here), and Reader's Choice for Best Greek/Middle Eastern by our local Irving Rambler! We love you all! for taste, quality, and value! "Very fresh and perfectly seasoned." 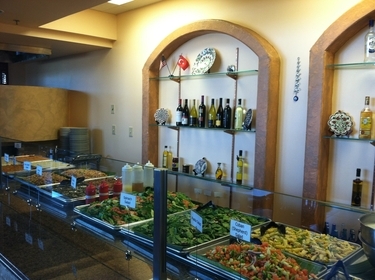 "One of our best Turkish food experiences throughout North America." That's how our diners describe our food. our weekly lunch buffet a try! Not sure what's on it? Check out these videos in which Kemal describes some of the food, here and here. Check out our special party menus, or create your own! ©2017 Zeytin Mediterranean Grill. All rights reserved.